This is for those who know and have the means to etch and drill a PCB by themselves. You can use e.g. a 3M CG3300 transparent overhead sheet and a laser printer to make the film. Make sure that the toner side will make contact with the PCB when exposing, but you already know exactly how to do this, right? The PCB is eurocard format, 10 by 16 centimeters, so slightly different to 4 by 6 inch. Dó use the eurocard format. In Europe you can get Bungard single sided positive resist PCBs at Conrad. As these files are for the experienced DIYers that go all the way all by themselves, there is no further support and you are on your own! I only support those who have been to a Benjolin workshop. So, don't bother me with questions if you etched and stuffed your own board and you think something doesn't work. All resistors are stock 1% metalfilm types. Every part of the schematic has been properly reasoned out and every value properly calculated. Using 1% resistors will insure everything works properly like it is meant to be. Changing values of components or using 5% or 10% resistors voids my warranty on proper operation. For getting a SSM2164 you are on your own, I will not supply them. And again, I only supply kits at the start of a workshop, you can NOT order a single kit from me if you don't come to a workshop. Two reasons for this. First of all there is the whole idea of the workshop where one gets full assistence in assembling the kit, and thus properly learn how to do such a project. The Benjolin is not only a fun box but the workshop is also a social and fun experience, and educational as well. And at the end of the workshop we make sure that all kits work. Second reason is that I simply don't have the time to sell kits over the net and give proper support. And if anyone has the bright idea to start supplying kits without my authorization you can be sure that you will forever be haunted by the evil eye and everyone will look down on you. So just you know. But if you think you are up to conducting Benjolin workshops yourself in your area simply contact me in private and we work something out. When you run the board with a power supply it is a very good idea to solder two diodes instead of the two battery connections. Do it in a way that the cathode of the diode is connected to the + of the battery connector and the anode connects to the - connection. This way the diodes do NOT conduct. The reason why this is a good idea is to insure proper startup of the voltage regulators when powering up. Without these diodes there is a chance that one power regulator starts up before the other and this will prevent the other from starting up, resulting in silence. The diodes fix this properly. If you use a non-symmetrical power transformer, like a wallwart thingy, two rectifier diodes and two elcos, either the + or the - voltage comes up before the other one, and that voltage will pass a regulator and make the other regulator sense an "inverted" voltage on its output and force the other regulator into permanent short circuit protection mode. The diode will short this "inverted" voltage to ground and assist the other regulator when it comes up just a fraction of a second later. These diodes can be simple 1N914 types. Check the 78L09 and 79L09 datasheets on the web if you would like to know more about this issue and little fix. thanks, Rob! this is quite wonderful. i would love to attend a workshop for all the reasons you describe, but unfortunately i doubt i'll be able to travel to do so. but this lets me in on part of the fun, anyway! thank you for your generosity. Since the SSM2164 is obsolete and Small Bear is out of them, the option is either to go with expensive and possibly risky EBay sellers, or to try the CoolAudio V2164D from Small Bear. Has anyone used this replacement chip? Is it a drop-in replacement in this situation? The V2164 from Coolaudio seems to be a safe drop in replacement for the SSM2164. My local supplyer just has CD4021BE. It seems like the ancestor of the MC14021BP?! Does the new one have anything essential for the functioning of the Benjolin? Might be a stupid question, but i dont have much experience with Shift-registers and cant see the differences. The letters in front shouldn't make a huge difference, as long as it is a CMOS 4021 shift register. I use CD4021, HEF4021 with no troubles. 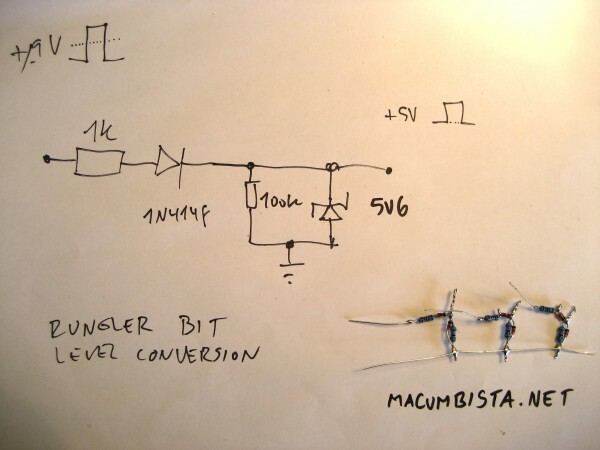 A small gift from the Macumbista.net Benjolin laboratory: a simple converter to turn the data bits from the Rungler shift-register (pins 2, 12 and 3 of the 4021B IC) to 5,6V gate CV outputs which stay on as long as the corresponding bit stays "high". Normally these bits are +/-9V, making them pretty unsuitable for most purposes. Enjoy! Posted: Sat Dec 12, 2015 8:07 am Post subject: Benjolin PCB or Veroboard layout in the UK? I wonder if anyone could help me with a Benjolin PCB or a Veroboard layout. I recently made the MFOS WSG using Andrew Sharp's strip board layout, took me nearly a week but worked first time, I used it to accompany a video I made. Regarding the V2165D I've just bought one from Small Bear no problems with me living in the UK, paid by PayPal, easy peasy. Excuse the typo it was the V2164D that I ordered, just checked the email, Phew!! I used to make Cyanotypes and have a face tanning lamp that I used as a UV source so I think I will be OK using that. I still have some OHT film and I used an inkjet printer to make the negatives so I think it will be OK for making PCB's. I tried the overhead sheet method. But press n peel works better, and faster. You do need a little bit of practice ( and trial and error), but that's no different for the photo route. I looked at the press n peel caper you mentioned and it does look like a good idea, but sadly I haven't got a laser printer or a convenient photo copy machine. What I did do was make two prints on OHT film (flipped in Ps) taped them both into register, placed them on my contact printing frame glass, emulsion side up positioned the PCB on top then carefully put the back on and locked it down. I read loads of stuff about exposure and settled for 11 minutes at 9 inches from the face tanner to the frame. Then 30 secs in the developer, washed it and then etched it in FC for 35 mins. To be honest it couldn't have been simpler! Here's a scan of the almost finished board, just some of Vicky's nail varnish remover needed. That is really sharp, some of my etches are this sharp but the majority aren't. Probably also because of my etchant though, muriatic and peroxide isn't the most refined mixture for etching. Just a head's up for the DIYers.... normally I have used TL074CN op-amp ICs for this project. My supplier recently sent me TL074L chips instead, and I had a big problem with them. Using the "L" variant, the resonance of the filter is not present at all until the very end of the pot turn, at which point it explodes into distortion. I thought the "L" indicated "low power", however the supplier insists that it is functionally no different than the "CN" version and that the "L" means "Lead free". I would have to disagree with the first part of their answer. Another exciting victory for ROHS!!!!!!!! Yeah, the one datasheet where I found the "L" variant had it indicated as RoHS compliant, although most versions probably are by now. My guess would be that it is supplier related, everybody does their own version. Low power version is TL064?